Hello. This post is here to serve notice that the new Toyota Supra, a hotly anticipated sports coupe that definitely exists (?) somewhere (???) is not present at the 2017 Los Angeles Auto Show. Once again, for those who may have missed it: not here. Not in LA. Not present. Other Toyotas on display include a new crossover concept, and some vehicles already on sale, such as the all-new 2018 Camry. Be advised that these vehicles are not the Supra. When last we considered the new Supra, we discussed how it was odd it didn’t come to the Tokyo Motor Show, as many had anticipated. 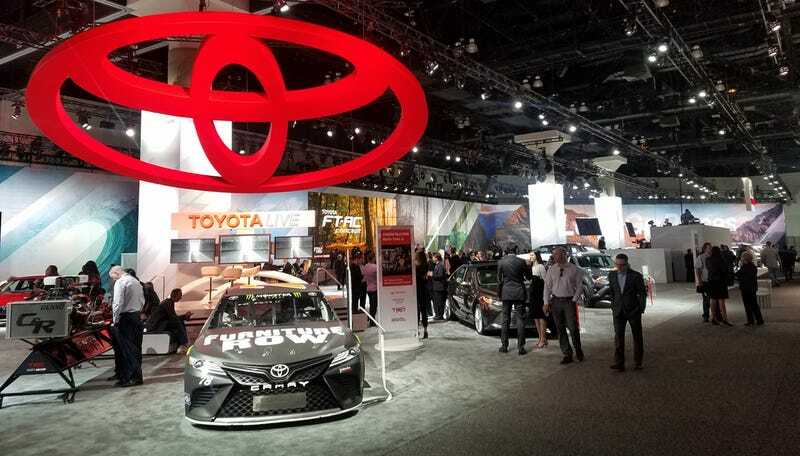 Perhaps, we surmised, Toyota was saving it for an American debut in Los Angeles—a place ostensibly full of fun and sunshine and displays of extravagance. A natural home for a sporty coupe, if you will. This did not happen. I would apologize, but the decision was not mine. The last time we actually saw the Supra, it was chilling in Tokyo, and before that it was on vacation in Italy with some BMWs. Perhaps the car decided it would rather tour the world in a leisurely fashion, rather than actually go on sale to the car-buying public. I can’t say; I haven’t seen it. We will let you know if we hear and/or see the new Supra anywhere.